Omega 3 supplements are commonly used by adults and children in the United States. Their health benefits range from fighting inflammation to lowering bad cholesterol and relieving arthritis pain. However, omega 3 supplements can cause side effects such as dizziness when taken incorrectly. If you're planning to supplement your diet with omega 3, consult your doctor first, especially if you have a medical condition. Omega 3 fatty acids come from foods such as cold water fish like salmon, herring and mackerel. These fish are rich in the omega 3 fats eicosepanteneoic acid and docosahexaenoic acid, EPA and DHA. Plant foods such as walnuts and flax seed are sources of another omega 3 fat called alpha-linonelic acid, or ALA. These healthy fats have antioxidant and anti-inflammatory effects and are essential for the body for a variety of reasons, including cognitive function, blood clotting, nerve and cell membrane production and hormone activity. Two of the ailments that omega 3 may help to treat are diabetes and high blood pressure. However, some people may experience increases in fasting blood glucose levels when they take omega 3 supplements, notes the University of Maryland Medical Center. High blood sugar, or hyperglycemia, can cause dizziness and other symptoms such as dry mouth, frequent urination and fatigue. Also, if you're taking medications or herbs to lower high blood pressure you should use omega 3 with caution, as it, too, can lower blood pressure. When your blood pressure is too low — less than 90 mm Hg over 60 mm Hg — you may become dizzy or light-headed. In low to moderate levels, omega 3 supplements are general considered safe. 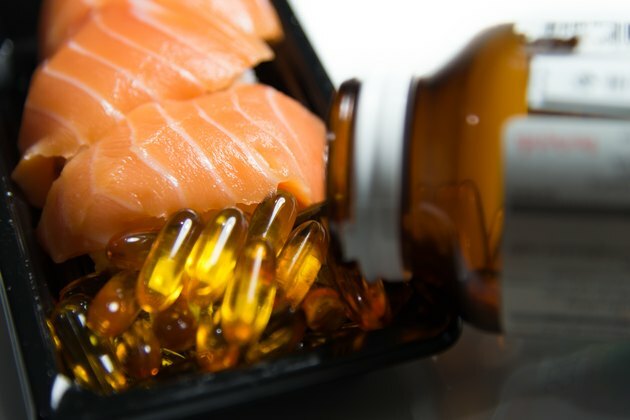 However, if you take more than 3 g of omega 3 daily from supplements, you're more likely to experience adverse effects such as dizziness, heartburn, nausea and diarrhea. For general overall health, it's best to get omega 3 from fatty fish such as salmon, herring, mackerel or sardines. To treat a specific condition, such as heart disease or high blood pressure, seek medical advice for the best dosage recommendation. Your doctor will base the dosage on the amount of eicosepanteneoic acid and docosahexaenoic acid in the supplement. An occasional bout of dizziness isn't unusual, such as when you jump out of bed too quickly or if you've been exercising without hydrating properly. But if you've suffered several bouts of dizziness and suspect they may be related to taking omega 3 supplements, stop taking the supplement and seek medical attention. By properly managing any underlying condition — such as diabetes or high blood pressure — and taking an appropriate dose of omega 3, you can reduce bouts of dizziness. Cleveland Clinic: What Is Dizziness?